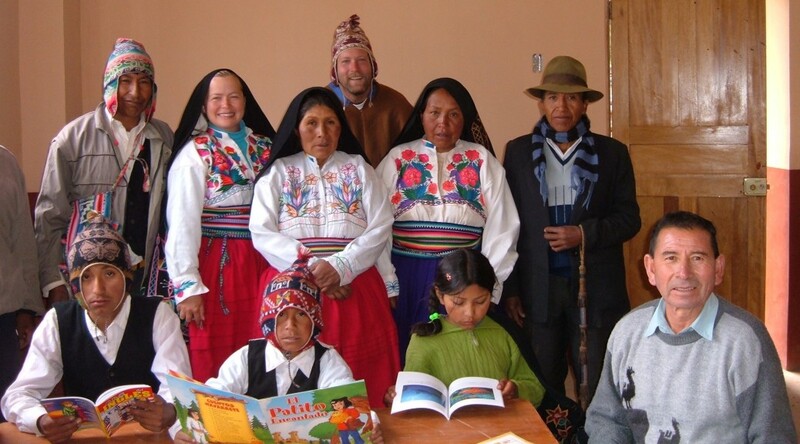 “Barbara, some nights I can’t sleep because I have this dream – the dream to bring literacy to the people of the islands.” “Victor,” I replied, “I know people in Arizona that will help you.” And so the Lake Titicaca Literacy Project was born. 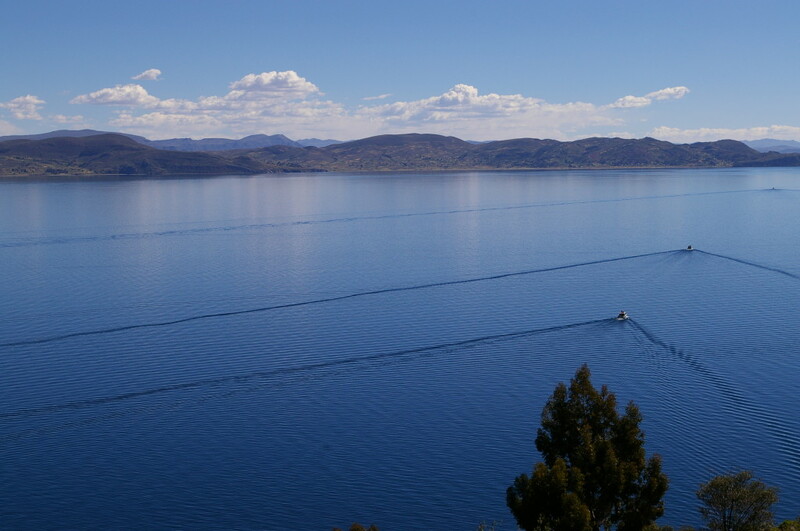 Situated in the snow-capped Andes at over 12,500 feet and bordering Bolivia and Peru, Lake Titicaca is the highest navigable lake in the world and site of the famous Uros floating islands. These islands composed of thick mat-like layers of tortora reed, a cattail-like rush, are home to members of the Uros tribe or “people of the lake.” The tortora is the source for their food, shelter, transportation, and livelihood. About fifty islands float in the shallows with only a few families inhabiting the smaller ones. Children row their boats to the school on the largest island. Victor Pauca, my guide, distributed books to a young mother on Toranipata Island as he checked on her progress of reading to her son. Victor realizes the importance of literacy and how it can offer opportunities to the island people. Our journey continued as we traveled for three hours under the intense sun to Taquile Island, a fixed island, fifteen miles away. Here I would visit a school to share the pencils, notebooks and picture books that I brought from home. The terraced hillsides of the island were visible from a distance. Corn, potatoes, fava beans and quinoa are the main crops for this self-sufficient community of about 1200 people. Silvano and several schoolchildren met us at the dock. Silvano wore the traditional dress of a married man – black pants and a white flannel shirt, a wide, colorful, woven belt called a chumpis and a chullo, a knit cap ending in a red tassle. Boys wear chullos with white tassles. Women and girls dress in multi-layered skirts, colorful blouses and dark shawls for protection from the sun. As we slowly hiked the steep stone path to the missionary school, I was handed an aromatic herb to smell to help alleviate the shortness of breath caused by the thin air of the altiplano. The young professora and her students greeted us with wide grins and laughter and enthusiastically showed me their one-room school. The people of Taquile Island are recognized for creating the finest textiles in Peru. Girls and boys are proficient knitters by the age of seven but can they read? School supplies are minimal and books are hard to find on the remote island. 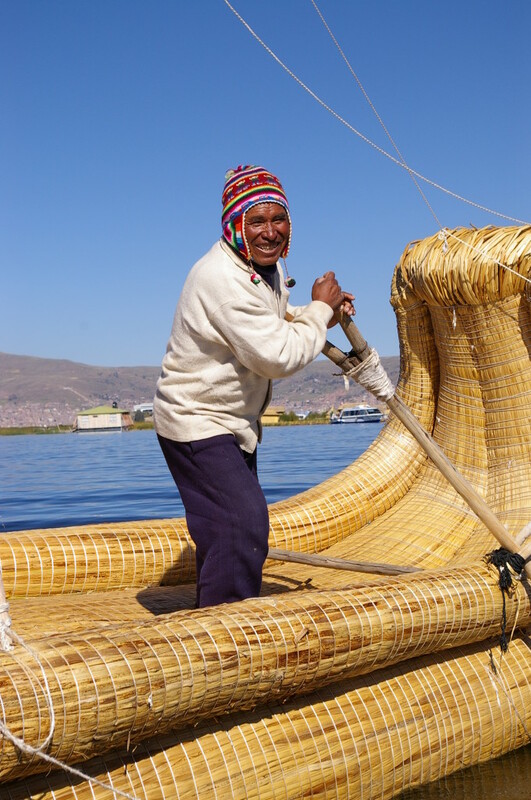 Yet, Victor is determined to help the indigenous people of Lake Titicaca. It is his dream to build community libraries, offer parent education programs and encourage families to acquire the habit of reading. He believes that literacy will lead to people with leadership skills, a necessity for the future of these communities. Since that boat ride on the lake, Victor has seen his dream become a reality. 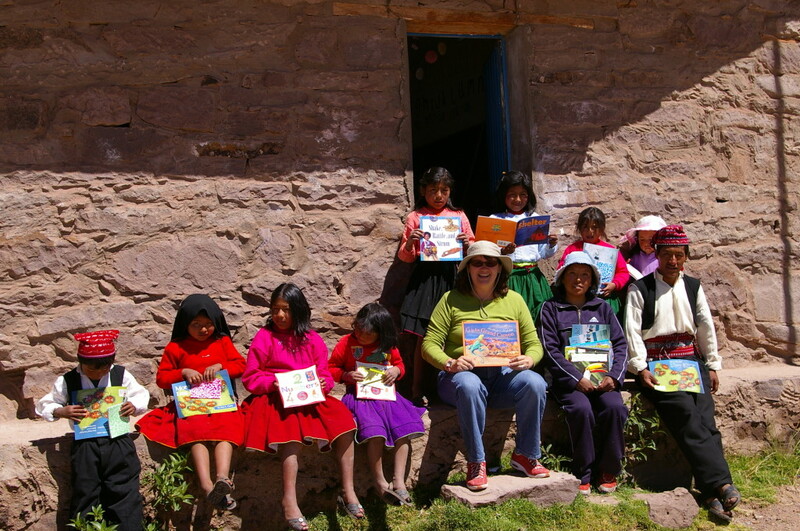 The Greater Paradise Valley Reading Council (part of the Arizona Reading Association) adopted the Lake Titicaca Literacy Project as their international community service. We held raffles and book fairs to raise money. School kids had used book sales. It only takes $2000 to build and furnish an island library. Victor’s plans are for libraries in seven communities. I completed the Developing Countries grant from the International Reading Association that resulted in a $1500 donation. Visitors to Peru have joined Allways Travel and Victor in donating their time and money to help community members build their libraries…brick by brick and book by book. In 2014, this grass roots project that began on a boat ride eight years ago was nominated by USBBY, the United States Board on Books for Young People, for the IBBY (International Board on Books for Young People)-Asahi Reading Promotion Award. Although we did not win the $10,000 prize, more people have become aware of the Lake Titicaca Literacy Project. 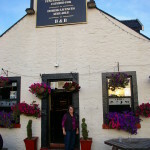 When Ed and I visited Scotland, we took a side trip from the incredible golf courses and journeyed to Wigtown in the far southwest corner of the country. 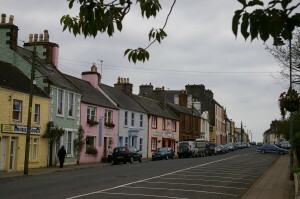 Wigtown is Scotland’s National Book Town. 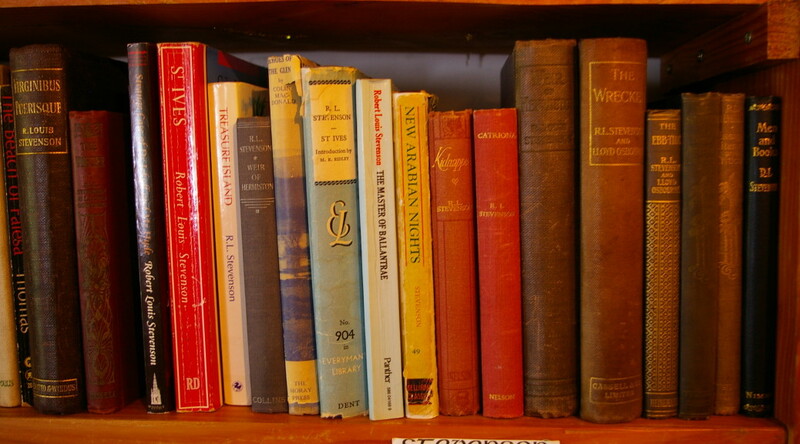 Our adventures in Wigtown involved hours rummaging through used book stores in search of golf books for Ed, material for Katie’s English lit thesis and folktales for me. I did find a surprise – a Happy Hollisters book just like the ones I received when I was a member of the Book of the Month club as a child. I always do my homework before I travel and look for any story ideas as I peruse through travel books. 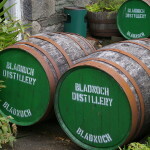 Just a mile down the road from Wigtown is the village where a Scottish folktale, the Brownie of Bladnoch, takes place. 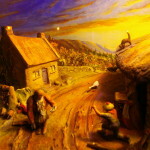 The Brownie of Bladnoch originated as a poem written by William Nicholdson in 1825 and is considered to be “the greatest piece of vernacular literature that Galloway has ever produced.” Too bad no one that I spoke to remembered the story unless they recently visited the Bladnoch distillery where a diorama featuring the grotesque brownie enlightens scotch drinkers. Too much scotch and they wouldn’t remember it for long! 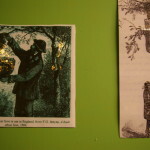 So I hit the trail in search of material to help me in retelling this folktale. I scoured books in the St. Andrews library and learned that the hump-backed, toe-less brownie of Bladnoch may actually have suffered from leprosy which explains his unsightly looks. Not suitable information for kids but I found it interesting. 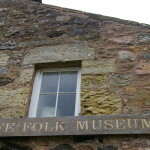 I toured the Fife Folk Museum in Ceres. 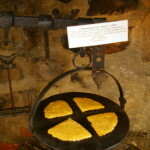 There I discovered that bannock or oat pancake is cooked on a girdle – not a griddle and that belted cows sleep in a byre. Scottish culture is filled with fairy folk including helpful little brownies and the Brownie Girl Scouts are named after them. I think this is a great story for kids and that’s where the problem lies. I’m a writer of nonfiction and the concept of story arcs, character development and dialogue are foreign to me. But I’m not giving up. I’ve written and rewritten, had it critiqued and rewrote it again. So now it’s just the hunt of finding the right publisher. And my visit to the American Library Association conference may have uncovered the one. I’ll keep you posted. 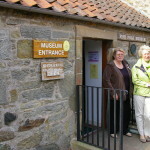 A trip into Edinburgh meant a visit to museums including the Writer’s Museum. 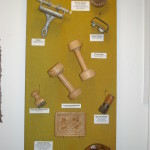 I also stumbled upon an interesting exhibit on children at work. Imagine being hired as a bird scarer! 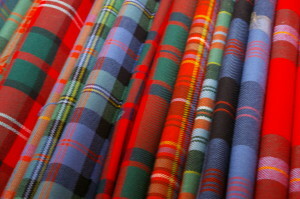 All the images, sounds, information, smells, and tastes (yes, I did drink scotch and tasted a morsel of haggis but couldn’t wrap my mind around eating something containing sheep’s pluck!) 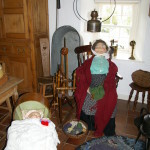 are tucked away for that future story, magazine article or book. That’s the fun of being a writer – I’m always looking for story!